It's September. The first of Minnesota's deer hunting seasons begins (archery) in a couple of weeks. If you are a Minnesota bowhunter and if you haven't already scouted, you ought to get at it this coming weekend. Why so soon? Well, to be productive, preseason scouting should be thorough, and thorough means you will necessarily make whitetails raise their tails and bound away, with or without your knowledge. Alarmed adult does, fawns and yearlings are likely to abandon their ranges and/or become almost completely nocturnal (move during nighttime hours only) for a period of two to seven days. Bucks 2-1/2 years of age or older are likely to remain off-range and/or become nocturnal for a period of two to three weeks. 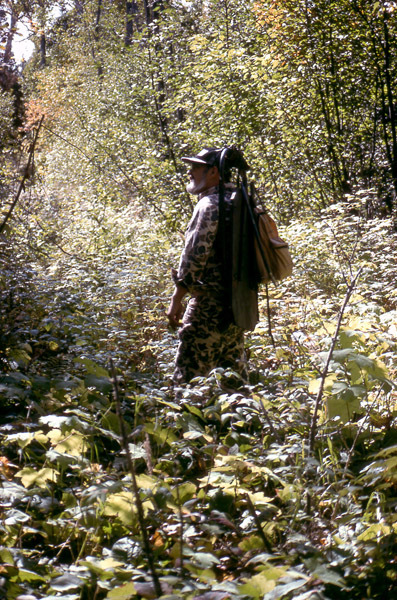 Ideally, therefore, you should complete your scouting and stand site and approach trail preparations two to three weeks before hunting begins. 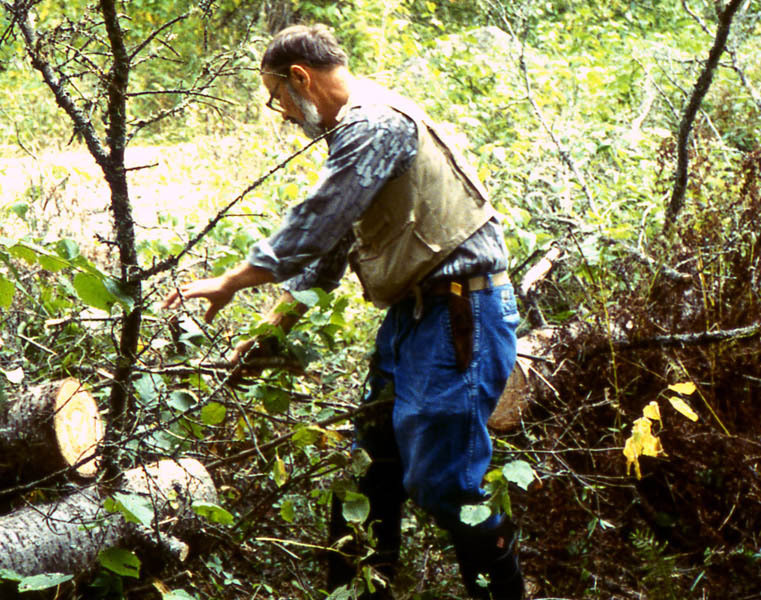 Doc clearing a windfall that fell over a deer trail. Keep this in mind, however, preseason scouting is optimally productive for only the first few hours to two days of a hunting season. Especially for bowhunters the number-one reason is today's experienced adult whitetails (2-1/2 years of age or older) constantly search for, readily identify and thereafter avoid hunters perched in elevated stands. Once a whitetail of this age group has discovered you at a certain stand site (via sight, hearing or smell) it will be wary of that site for the rest of its life, carefully checking to determine whether or not you are there each time it approaches the site, likely detouring widely around it, maintaining a distance of 50-100 yards or more depending on density of cover, even when you are not there. 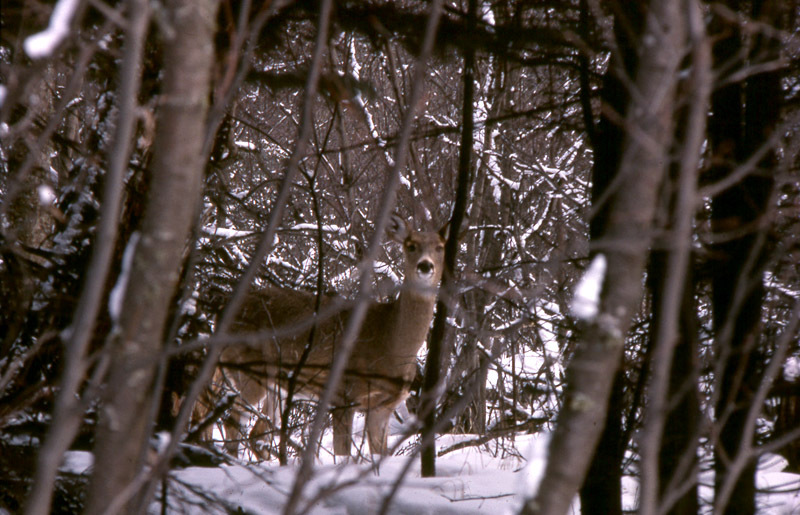 Worse, by example adult deer that avoid your stand site will teach other deer to do the same. Even if you are somehow able to extend the time before whitetails discover your stand, natural changes that affect the lives of whitetails will soon begin to reduce your odds for hunting success regardless. Right now, today, for example, bucks are rubbing velvet from their now fully developed antlers on small trees and clumps of woody shrubs. In a few days all bucks two years of age or older will quit limiting movements to the vicinity of their secluded bedding areas and begin exploring and utilizing the entire extent of their overlapping home ranges (each buck range one-half to two square miles in size). This, of course, will make it difficult for the hunter to predict which trail a certain buck will use on any one day. 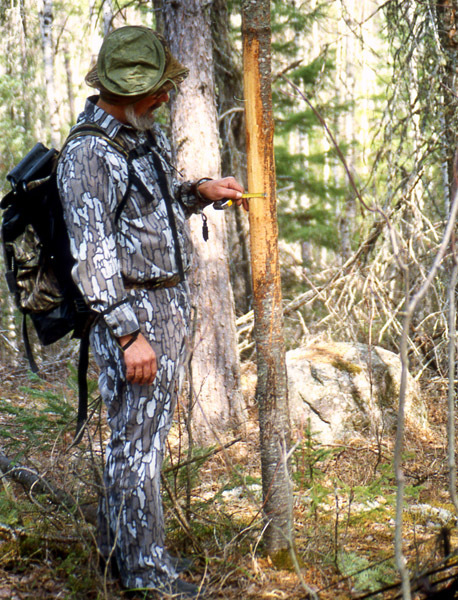 While scouting, Doc has found a small antler rub. While scouting, Doc has found a large antler rub. Mature bucks will soon begin feeding among or near does with young and/or other bucks. Late in feeding cycles antlered bucks will occasionally spar (not serious) or battle (serious), antlers engaged, to establish a new buck pecking order. Bucks that vanquish all others will thus earn the opportunity to breed most if not all does living within their home ranges (in November). All this new socializing with other deer (lots of eyes, ears and noses to keep track of things) will make it easier for all whitetails to become aware of and avoid nearby danger, increasing your odds of being discovered while hunting. Also, this month the whitetail's thin, reddish fur of summer will begin to be replaced by the warm, more-difficult-to-spot, gray-tan fur of winter, a change that commonly makes whitetails less active during warm daytime hours in September, October and even November. Later this month leaves will begin to fall and whitetails will then begin to switch to using trails that can provide adequate screening cover in a leafless environment, trails coursing through dense brush or evergreens, for example. And this is only the beginning of such changes. 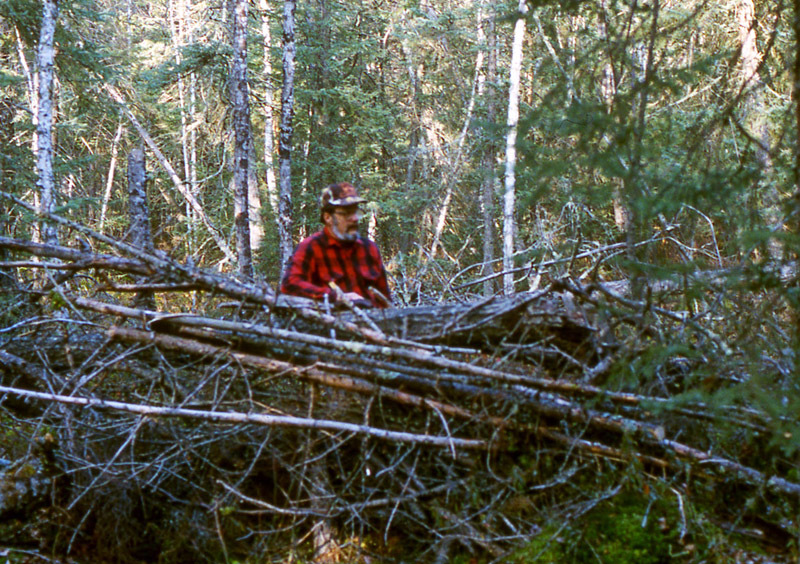 A pile of brush near a deer trail is cleaned up for use as a ground blind. While scouting, we discover many locations that can be used as natural blinds. Despite its short period of hunting value, preseason scouting is nonetheless well worth the effort. In our hunting camp it accounts for one-third to one-half of all the mature bucks we have taken in the last 20 years. During my last four hunting seasons I shot three adult bucks (an eight-, ten- and 12-pointer) and almost took a fourth. Preseason scouting made it possible to take two of them, one at 9:15 opening morning. Mid-hunt scouting led us to all the rest of the adult bucks we have taken. What in the world is mid-hunt scouting? As stated above, preseason scouting quickly loses its hunting value. Following opening weekend, we Nordbergs do not merely depend on luck while hunting older bucks. "Big Boomer" in a Fresh Whitetail Bed of a Monster Buck. Beginning on day two, we actually scout every day of a hunting season, using a wolf-inspired tactic that enables us to locate trails and areas currently frequented by adult bucks and other deer (new stand sites) without upsetting their habits or causing them to abandon their ranges and/or become nocturnal. It works because (as wolves know) even experienced adult whitetails react much differently upon identifying non-hunting humans or non-hunting wolves. Wolves have long been taking advantage of this. After November 1 when most Minnesota fawns are finally capable of outrunning wolves, it becomes more difficult for our wolves to regularly obtain their favorite food, namely venison. To gorge on venison at least once weekly (a normal time span between meals for wolves in winter), our wolves form packs of six or more (plus pups) and hunt cooperatively, keying on deer slowed for some reason (wounded, starving, sick, aged or deer restrained by deep snow). Much of their success depends on some clever deception. While cruising single file in search of a vulnerable deer (identified via fresh airborne or trail scent) along established trails that course through most whitetail home ranges or wintering areas within their 100-plus-square-mile hunting ranges, wolves are careful to avoid alarming whitetailsthus, keeping selected prey from bounding off before they can set up their hunts. Upon discovering the scent of a potential prey, they do not immediately begin pursuing it. Instead (as I have occasionally observed or determined via tracks in snow), they continue moving on past, heads pointed straight ahead, acting as if totally disinterested in the nearby deer or unaware of its presence. Experienced adult deer that have lived among wolves all of their lives typically react to such a sight with little or no fear or alarm. Whether bedded or standing, they simply freeze without regard for screening cover and watch the wolves move jauntily past, tails wagging, then resuming whatever they were doing before the wolves appeared. The wolves deliberately avoid every nuance of behavior that might suggest the deer is in dangerno sneaking, no halting to peer about, listen and sniff the air or tracks and not one single glance toward the deer. When out of sight and hearing, downwind or crosswind, all but one of the pack will widely circle the chosen prey until downwind and wait for the wolf that remained behind to sneak close to the intended victim and chase it with all possible speed toward their ambush. It doesn't always work. If the deer has experienced pursuit by wolves before and can outdistance its pursuer enough before being driven close the waiting pack, it will veer right or left and begin running into the wind, thus avoiding ambush. The entire pack may give chase at this point but rarely will they pursue a well-running whitetail a great distance. Rather than waste their energy on a deer they cannot catch, theyll soon resume cruising in search of another potentially prey. Though we human hunters cannot select whitetail quarries via our nosesour eyes, certain knowledge about whitetails and wolf-like, mid-hunt cruising will not only enables us to identify certain desirable quarries (bucks) to key on without actually seeing them, but they insure we will almost always be close to such a quarry during every half-day we hunt. In each of our separate stand hunting areas, most of which overlap, we select a series of connecting deer trails that widely loop through or are adjacent to areas where deer tracks, droppings antler rubs, ground scrapes and evidences of feeding are usually abundant. They are discovered through recently scouting and while scouting and hunting during previous years (to help keep whitetails from abandoning ranges, we avoid bedding areas). We then clean these trails somewhat, removing dead branches and such so they can be hiked without difficulty. Most of our stand site approach trails branch off from this looping trail, now referred to as a "cruise trail." Almost every September or October, we all find one or more reasons to alter portions of our cruise trails, selecting new connecting deer trails that course through previously overlooked areas found to be loaded with promising deer signs. It's work that almost always pays off. Beginning about 11 a.m. on the second day of each deer hunting season, we begin spending the hour before lunch hiking along our cruise trails searching for: very fresh tracks, sharply defined and five or six inches long; tip through dewclaw or 3-1/2 to four inches long for hoof only; and/or droppings, shiny and 3/4 to one or more inches in length, made by bucks 3-1/2 to 6-1/2 years of age. If does were our intended quarries, we'd search for very fresh tracks, 4-1/2 inches long, three inches for hoof only, and shiny droppings 1/2 inch long, made by mature does (not fawns or yearlings). 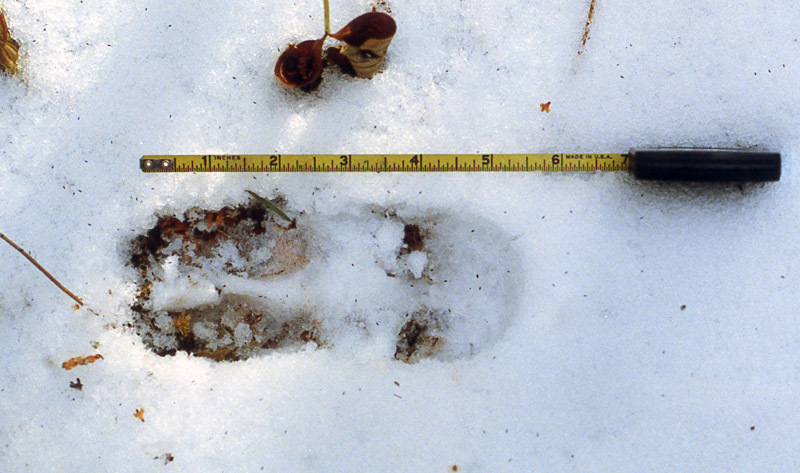 A fresh whitetail buck trackdefinitely a big buck. 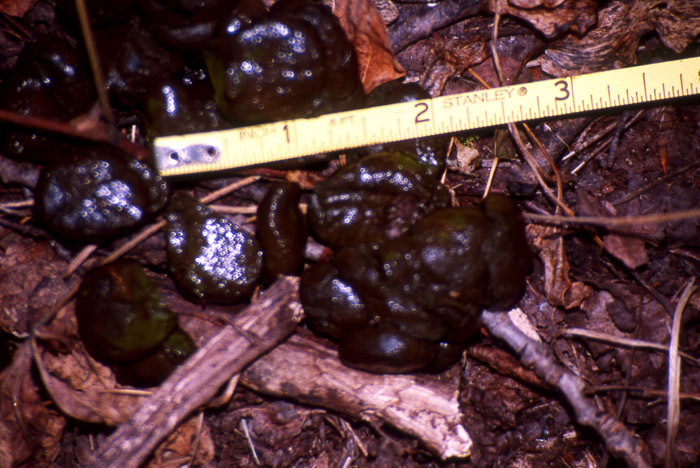 Based on size, and clumping, these are fresh droppings from a big buck. 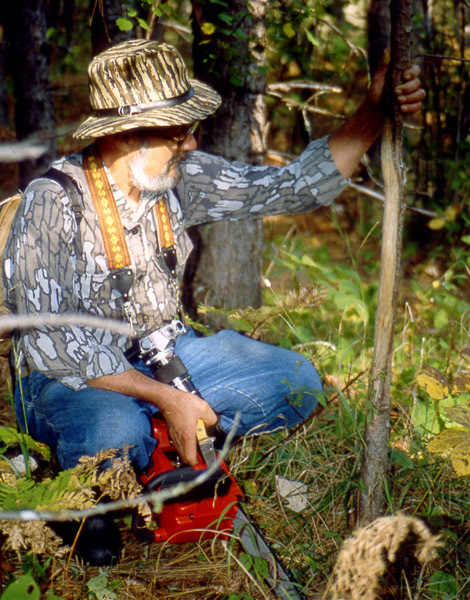 Having measured tracks and droppings to identify whitetails for more than 40 years, we now easily and accurately identify deer via these readily found signs on the fly, never stopping to measure them. As we have learned over the years, the bucks that made these signs are not uncommonly near when we spot them. 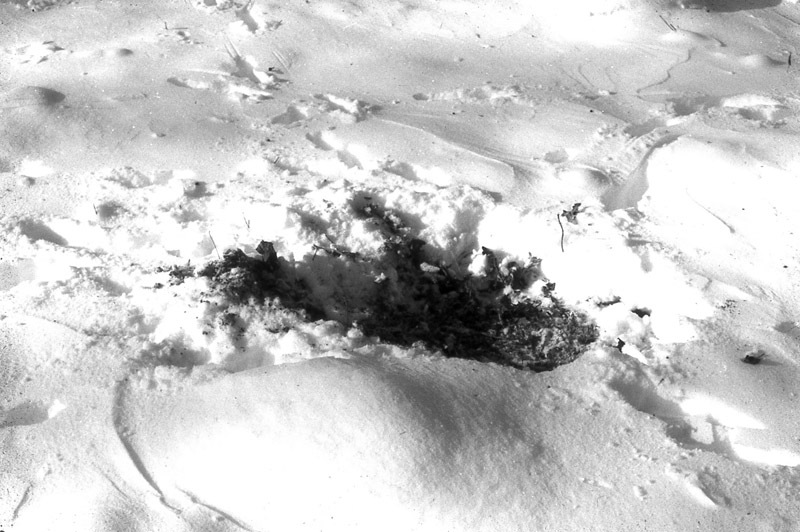 If an older buck sees you halt to inspect its tracks or droppings, it will likely abandon the immediate area for the balance of the hunting season, rendering the valuable deer signs you just discovered useless. Knowing the average hunter passes within easy shooting distance of eight or more whitetails per mile traveled on foot without realizing they are there (opening weekend), upon discovering very fresh, adult buck-sized tracks or droppings, we Nordbergs, like wolves, march right on past, heads pointed straight ahead, not stopping until out of sight and downwind or crosswind or until reaching camp. Such discoveries reveal where to hunt next, this afternoon and tomorrow morning. Back at camp we check wind direction, the local weather report on our weather radio and our hunting area map before deciding how best to return to sites where these fresh signs were found. We always approach from downwind or crosswind and sit on our backpacked stools at ground level downwind or crosswind within easy shooting distance of these signs, hidden by a solid, natural background and unaltered intervening cover. 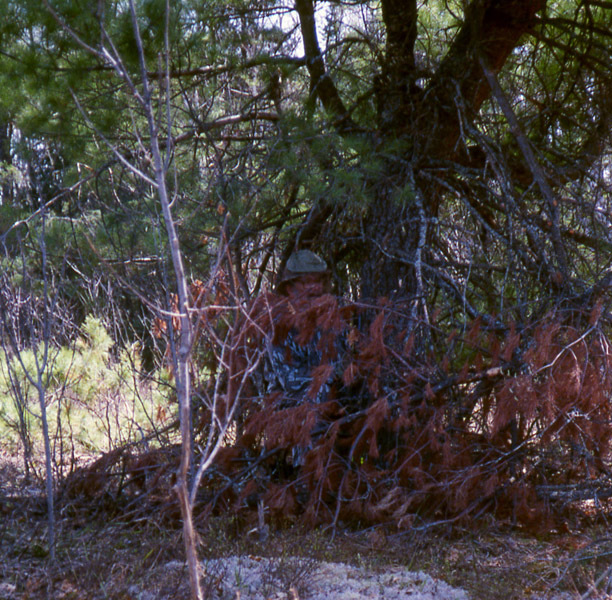 Sometimes we are able to use stand sites selected and prepared while scouting weeks earlier and sometimes we must make do with whatever natural cover is found near the site. 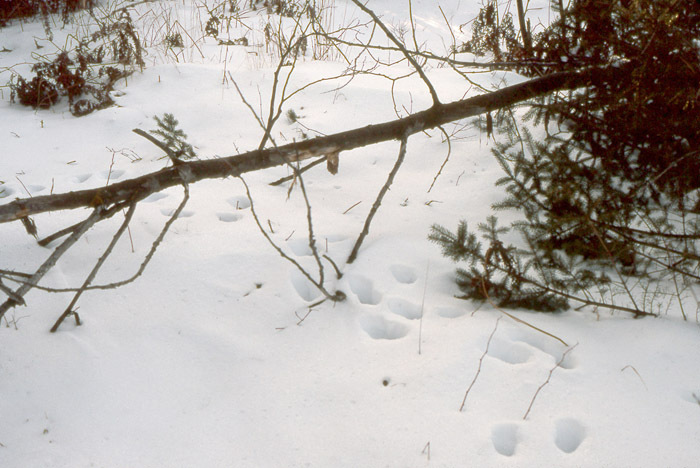 Upon discovering tracks of a large buck accompanying tracks of a doe, we generally hunt the nearest known feeding area during the next feeding cycle. Upon discovering a ground scrape freshly renewed in November with dirt and turf pawed widely to one sideknowing the buck that did this will return soonI immediately back off downwind and make myself comfortable behind some intervening screening cover (except at nightfall in which case I'll be there early the next morning). 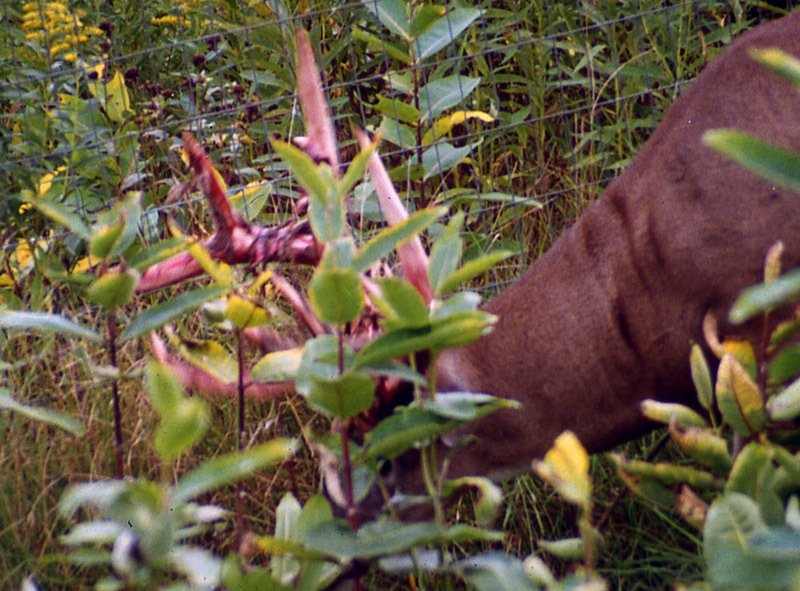 If you desire a trophy-class buck, then this is your best FRESH SIGNnot fresh meat! If there is a big buck close by, it is unlikely you will get a chance at him now. Sodon't stop. Don't look at her. Don't raise your weapon. No sudden movements! Don't alarm her in any way. Just keep walking by. Plan your next half-day hunt based on her location. While cruising in search of fresh deer signs, it is unnecessary to worry about wind direction or sounds of your footsteps. In fact, it is best if deer ahead smell or hear you coming so they can move aside and freeze in cover before you are near. As long as you keep moving non-stop at a moderate pace, head pointed straight ahead, habits of encountered deer will not be affected by your passage. Those deer will be near when you return and your odds for hunting success will be infinitely greater than if you simply select a spot to hunt because it has a wide view or it looks good. 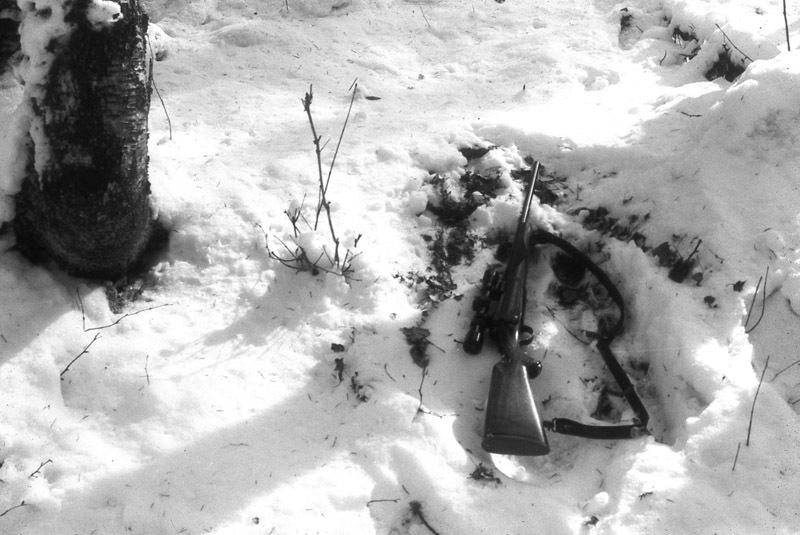 Finally, if you stand hunt for a half-day near very fresh tracks and/or droppings and fail to see the kind of deer that made those tracks or droppings, assume it knows you are there, likely having discovered you via sight, hearing or scent without your knowledge. Unless you have a very good reason for hunting at the site an extra half-day or two, move to another site where you discovered other very fresh tracks or droppings of a size characteristic of the class of whitetail you'd like to harvest. Being discovered by one or more whitetails at a site where you were quietly sitting, exhibiting no behavior characteristic of a hunting wolf or human, about the only damage you will have done is create a circle with a radius about 100 yards that will be avoided by the experienced adult deer that found you during the balance of the hunting season. Each time you move to a new stand site 100 yards or more away, you'll be back in the ballpark. To avoid you, your intended quarry must find you all over again. This cannot go on forever. Sooner or later, that deer will make a mistake and you find it in your sights, looking exactly as you imagined it would look.